5793 labyrinths found. Showing 3101-3120. Sorted by country, state, city, then zip/postal code. Enter thru driveway shared with the Seneca Academy on Germantown Road. Free parking. All are welcome, any time. St. Alban's labyrinth was built to the glory of God and in memory of Robert L. Dunker. The labyrinth is in front of the church at 105 1st Ave. S.W. From the intersection of MD 648 (Baltimore - Annapolis Blvd. and RT 3 Business (Crain Hwy. ), proceed 2 blocks South on Crain Hwy. Turn right onto 1st Ave. S.W. and proceed 1-1/2 blocks to the church and the labyrinth. 39.16 N° Lat. ; 76.63 W° Long. Approximately one mile west of I-81. Turn right into church property. Labyrinth is north-east of the parking lot. Located directly behind the church, you can walk to the labyrinth from either parking lot. The labyrinth is just off of camp road across from the Potomac Lodge. Visitors should first check in at the main office. Mar-Lu-Ridge is open year round and loves having visitors. Simply call the main office to check in and to make sure there is not a retreat group using the labyrinth. Located behind the Church building. Parking lot is located on Everett (just off Connecticut Ave.) in Kensington north of the DC beltway. This is a 5 circuit heart labyrinth, created in the fall of 2012. It is located behind the church facility and easily accessible from the parkling lot. This is a 5 circuit heart. Chelsea a la Chartres design from the Labyrinth Company. Approximately 5 minutes from Rt. 70. The Bon Secours Labyrinth was built in February 1999 through the generous donations of many and a grant from TKF Foundation. 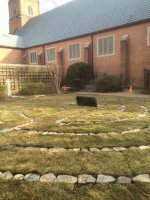 The Labyrinth is the focal point of a one-acre "sacred space" set aside as Holy Ground to commemorate the 175th anniversary of the founding of the Congregation of Bon Secours of Paris - a religious order of women whose mission is to provide "good help to those in need." Located on main campus, off Mosser Road. U.S. Rt. 219 to Mosser Road in McHenry, Maryland; follow signs to Garrett College. Driveway is actually on Club House Rd. The labyrinth is located on the far side of the parking lot in a grassy area in between the pavement and the treeline. 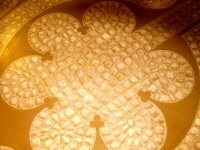 All are welcome to use this labyrinth, and we would love to hear from anyone who enjoys it. My labyrinth is an all natural labyrinth. I encourage you to bring something to plant in this exciting nature labyrinth. 7 circut, all natural labyrinth. 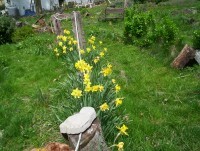 I just mow the path and plant bulbs and what ever else feels right. The Boardwalk Labyrinth - "Never doubt in the dark what God told you in the light." The Ocean City Boardwalk Labyrinth is located in the Dewees Hall at St. Paul's by-the-Sea Church, just off the Boardwalk on the north side of 3rd Street. Open candle light walk every Wednesday evening, 7 - 9 pm, July through September. 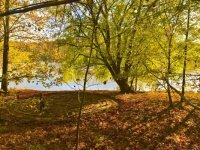 You may call to arrange an alternative time, or group workshop/walk. 38.336 N° Lat. ; 75.085 W° Long. A Place Of Grace, St. Johns Lutheran Church labyrinth in Parkville MD. A path for prayer, reflection and meditation. Church is located near the intersection of Harford Road and Putty Hill Avenue. 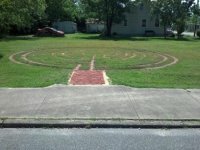 Our labyrinth, A Place of Grace, is in the park behind the church parking lot! Again, outside groups must complete and receive approval for labyrinth use. Although the labyrinth is located on private church property, we do allow other churches/groups to use it. If you are interested in using the labyrinth, you must complete and receive approval for facility use. At corner of Second and Cedar Streets across the street from the church. Park at the two parking lots across the street from the Old Angler's Inn. Walk down to C & O Canal towpath and make left turn towards DC. Immediately make right turn onto path down towards Potomac River. The stone laid labyrinth will be located under large Maple Tree.